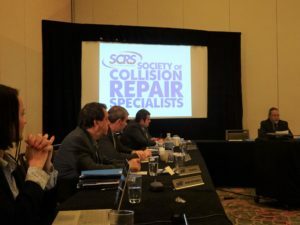 Recognition by Hyundai and CCC of collision repairers’ needs were among the highlights of the past quarter for the Society of Collision Repair Specialists, leaders of the trade group said Tuesday. SCRS Executive Director Aaron Schulenburg told an open board meeting Tuesday the organization and I-CAR had worked to expressed the importance of OEM collision repair procedures to Hyundai, the only major automaker failing to provide such instructions. He said new personnel at Hyundai had been a “great resource,” and such communications were highlighted by the “recent success” of the OEM releasing two position statements. “While it’s a small step in the right direction, it is nonetheless a step in the right direction,” said Schulenburg, who noted issues like repairers attempting to seek Hyundai repair guidance on Facebook or just outright totaling the vehicles. Schulenburg also announced another successful instance of communication with a major company. He said SCRS members on State Farm’s Select Service program had pointed out the lack of documentation available within CCC when they agreed to or denied State Farm change requests. While the CCC development team’s backlog precludes it from being fixed in the near term, it will be a “high priority” when the team turns its attention to that backlog, Schulenburg said. CCC was receptive to the request and will look at a “more intuitive” means of displaying changes and showing a summary. He said it was SCRS’ hope that the new feature was “embraced sooner rather than later” for better “transparency” into why estimates were changed. Finally, the organization visited the OEM Collision Repair Roundtable and raised automaker awareness of the possibility that a vehicle defined as a structural total loss could somehow end up in the hands of rebuilders and sold again, according to Schulenburg and former Chairman Ron Reichen (Precision Body & Paint). Reichen said OEMs will examine a mechanism to flag a vehicle which was structurally unsafe — rather than an economic total loss — to keep it out of the commerce stream. • New board member Matthew McDonnell (Big Sky Network) mentioned a comment by attorney Todd Tracy noting that a vehicle owner’s manual called for seatbelts to be replaced if occupied regardless of the collision. He said he “ran with it” and found two OEMs in which the owner’s manual contradicts formal repair procedures calling merely for inspections of seatbelts rather than cutting right to automatic replacement. It does seem “crazy,” as McDonnell observed, that an OEM would want an automotive professional to use the owner’s manual. On the other hand, liability fears would seem to suggest a shop follow the strictest rules. It’ll be interesting to see how this plays out. • Schulenburg said SCRS will again bring Monday Repairer Driven Education courses to SEMA, and the full week’s lineup included many new speakers and some new ideas. “We’re developing some new things for Friday of the show” to introduce a little “freshness,” he said. • SCRS will ensure it provides “ample support” and recognition for SkillsUSA, according to Schulenburg. He said when he talks to new members, “more often than not,” their top concern is a lack of workforce. This emphasizes for the trade group the importance of competitions like SkillsUSA to show students “there’s an industry there waiting for them that supports them” and helps the businesses they enter, according to Schulenburg. SCRS has been working with SkillsUSA on ways to accomplish this, and it will again offer tool scholarships to winners, he said.